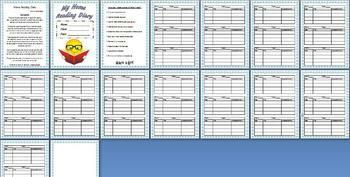 This is a simple and user friendly 14 page home reading diary. As teachers we know that it is crucial that a child reads everyday and not just at school but also at home. This resource is just the perfect thing to make that happen. 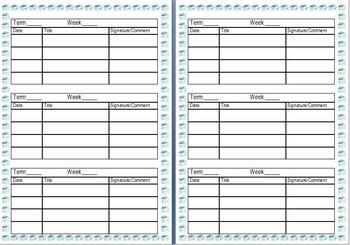 You simply print this out for each child either the way it is or you can format it when it prints to have two pages per sheet, if you want to make the booklet smaller for home use. There are spaces for the term and week of the school year. I left these blank as each school year changes and this then can also be used for school systems around the world. There are also spaces for the date, title of the book being read and a signature or comment. This is a great little resource that can be used year after year. It is great for keeping track of what your students are reading and how often. It also makes home reading easier for parents. This gets used every day in my classroom and is so handy to just have ready for each new school year. Upon purchasing my resources if you would like the word doc version to make changes just let me know.